Multiple forest-dependent wildlife communities are of current or emerging conservation concern. It is important to demonstrate value of working forests for these species and have data in place to enhance the foundation for forest management decisions and respond to future policy or regulatory proposals. In the western US, this includes understanding value of early seral forests, retained structures, and landscape composition. 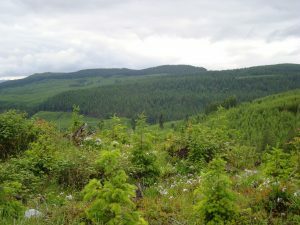 Early seral forests contribute important heterogeneity to landscapes in the Pacific Northwest. To better understand value of managed, early seral forests for biological diversity, we are documenting how plantation forestry alters the biodiversity and tempo of the early seral period from its primary natural counterpart, wildfire. At the same time, we will investigate extent to which active management may support species and communities traditionally associated with natural disturbance. Although research on effectiveness of structural retention in clearcuts of the Pacific Northwest has been conducted, questions remain on retention patch size, slope position of patches, and how adjacent vegetation types influence patch functionality. To address these questions, we implemented a manipulative study in Washington and Oregon, with a focus on understudied animal communities and treatments that are operationally feasible and within the bounds of existing forest practices rules. Forest management on public and private ownerships diverged approximately 30 years ago in the Pacific Northwest, resulting in differences in basal area weighted stand age. As a result, landscape composition differs substantially from historic conditions when stands >160 years old dominated most watersheds. We will conduct spatially extensive sampling for terrestrial species (e.g., native bees and pollinators, terrestrial salamanders, small mammals) across a gradient of average stand age with the use of modern sampling techniques to better understand response of biological diversity to forest characteristics at sub-basin watershed scales.